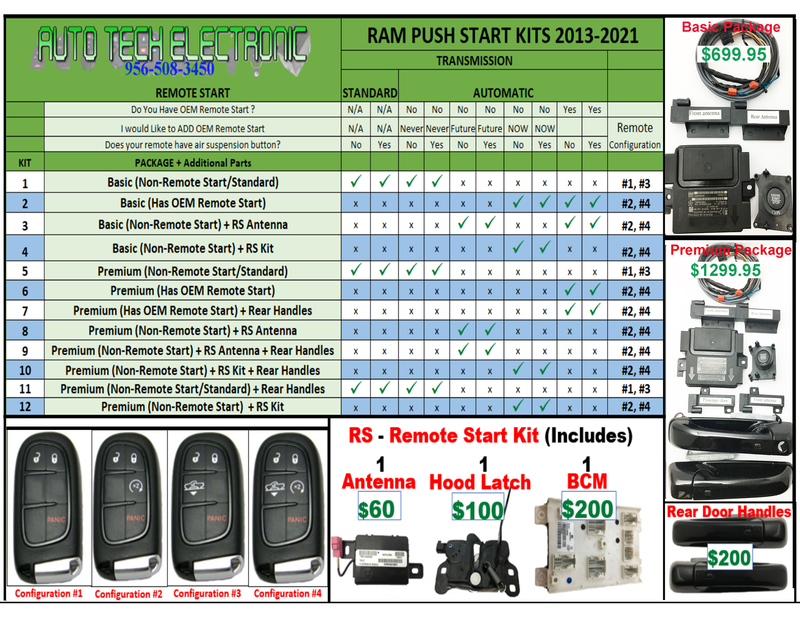 New OEM Proximity Keyless Entry Receiver Premium package. Kit 5 has no remote start, and is compatible with standard and automatic transmission vehicles. Front door handles are included. This is an entry level Kit without the Front door Handles to Enter the Truck. Just use New Remote to unlock the doors, enter vehicle, press the brake pedal and Push the Start button and Go. Keep the remote in your pocket. Does NOT include Rear Door Handles. You may purchase the rear door handles for an additional cost. I decided to upgrade to push start and it was the best decision ever. I don't have to take out my keys to open my truck anymore. it was the best decision to the staff that was very helpful with placing my order and helping me install my product also checked out their youtube channel to help me with my installment.